Download And Store Important Documents with FileThis | Brand On! 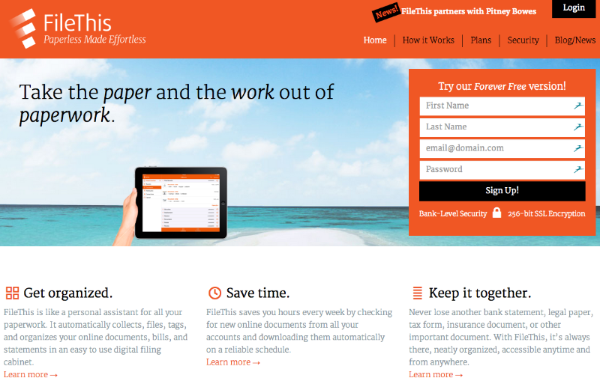 FileThis a service that goes out and grabs documents from your various online accounts and stores them in one place. For example, it can automatically retrieve your online statements, bills and other documents from companies like American Express, Chase, Amazon, and many more, saving you time from logging into the sites individually or hunting down email receipts. Choose whether you want to store these securely at FileThis, send them to your PC or to another preferred cloud storage provider such as Evernote, Box, Dropbox or Google Drive. This is a great idea, especially for bookkeeping purposes for small businesses. Cost: Free (up to six connections); premium versions for $2 or $5/month.